Occupied Kashmir once again rocked with Protests against Indian army recent killings in different areas of occupied Kashmir. Indian Army has martyred several innocent Kashmiri's in different parts of occupied Kashmir including four killings by firing on a Funeral. 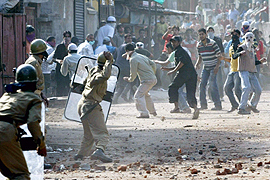 Due to these killings massive protests are taking place in occupied Kashmir. Watching this situation Indian army has imposed curfew in most parts of occupied Kashmir and SMS service is also closed down. India has killed thousands of Kashmiri people till now and tried everything to crush freedom movement but People of Kashmir are stil raising slogans "Le Ke Rahen Ge Azadi".